I have always been impressed with the personalized care Miranda provides and her commitment to treat the whole person. Unlike some, treatment from Miranda doesn’t end when you walk out the door. She is constantly researching and refining my treatment and keeps in contact with me to check progress. Her expertise in acupuncture and TCM has cured my back aches, PMS, anxiety, migraines, endometriosis and fatigue. She also has a great network of healers that she works with and I value her recommendations. I truly cannot imagine what my life would be like if I had not met Miranda! BEFORE: I felt physically like I was in my 70’s. Moving around was very painful and difficult. Sleeping was not as easy as I normally found in the past. The increased inflammation made simple chores taxing and left me tired and frustrated. To help with pain, I was taking three naproxin a day just to get through the daily activities of life. My diagnosis was rheumatoid arthritis and western medicine’s answer was immune blocking pills. NOW AFTER A MONTH: I am no longer on naproxin, can move around with near perfect ease for a person in their mid to late 30’s. Inflammation has been reduced completely in my hips, wrists and achilles. I have also lost the weight that I have always struggled to lose. I feel like I have more energy than before and have a much healthier outlook on life. Being an active individual, acupuncture has assisted significantly in preparing my body for whatever challenges lie ahead. Among many benefits, the techniques used have eased tightness from spinal issues and reduced swelling from joint sprains. I highly recommend Miranda’s treatments for general wellness and preventative care. A champion swimmer, I came with a 3-month old completely frozen shoulder and after 8 visits was competitive again in the pool. Miranda is the best acupuncturist I have seen, a 10 out of 10. Others I have seen I’d rate at a 4 or 5. I love that cupping! After my car accident I always had this lingering spasm on the left side of my spine. Miranda was persistent in chipping away at the spot. Now I just go every 3 to 6 months just because acupuncture keeps me feeling so great. The herbs have virtually cured my rosacea as well. Miranda has been my acupuncturist for several years. In that time, I have appreciated her clinical ability, her communication, and the results that her work allows. Miranda is my primary referral when my patients are seeking acupuncture. I support and encourage patients to have acupuncture, and for anyone wanting a safe, natural approach. I have confidence when I send a patient over to her, that they will experience a personable, caring, professional and effective health ally. I found Miranda after many unsuccessful years of seeking relief for my ailments through western medicine. I was feeling discouraged and frustrated. After one session with Miranda, many of the symptoms that had caused me so much distress disappeared. It was truly amazing! I would recommend Miranda’s services to anyone. She is extremely intuitive, highly skilled, and a pleasure to be with. You don’t have to have a specific problem to benefit from acupuncture. For example, you can just be grumpy and acupuncture can help you feel better. I’ve tried Western Medicine, Chiropractic and Massage, with no improvement in my guitar-back, shoulder, and TMJ pain. I was very skeptical about Acupuncture, to the point where I resisted going. Now, I’m very glad I did. I’m very pleased with the results from Acupuncture and Herb Therapy. I had a TMJ condition: clicking/popping in my jaw which started when I chewed down hard on some hard candy. It worsened over a period of several months. Finally when eating watermelon, I realized even soft foods were causing pain. I needed to do something. Adrian suggested I see Miranda. After a few treatments with Miranda the jaw has improved. There is no more popping or clicking. There is a little soreness in the area but that is going away. I no longer am nervous about eating and have not had any problems in this area. I suffered with this condition for 8-9 months, so it is SO nice not to have that problem anymore. 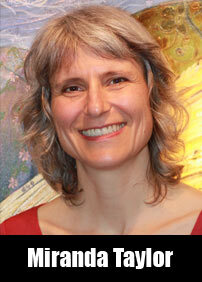 Miranda Taylor is a highly skilled, sensitive and determined practitioner with a lot of heart. I came to Miranda terrified of needles and decided she must have put me under a spell, because within minutes, I was on her table with twenty or so needles in me, feeling more relaxed than I had felt in months! I received regular treatments for a knee injury and emotional support during an intense healing period, and she was truly a life saver. The stiffness in my knee has lessened, my energy has increased, and I feel much more emotionally resourced. I highly recommend Miranda’s acupuncture, herbal treatments, and Craniosacral work to support your healing process. BEFORE: I struggled with depression, fatigue, anxiety, digestive issues, back pain — most of these symptoms since childhood. I injured my back in June 2011 and did not heal. I tried every possible thing for three months and went to the ER 2 times. NOW: I am no longer experiencing any symptoms except for some back pain which continues to improve every day. The improvement happened so quickly and the quality of my life changed dramatically. I haven’t felt like this in years. I have been working with Lory for years now for a bunch of medical problems that I have, including a pretty nasty case of multiple sclerosis. I have been with her five or six years at least, on a regular basis. She is expensive, my insurance does not cover her treatment. I may have been born at night, but I wasn’t born LAST night. There is a reason I lay out all my cold hard cash to Lory. Her stuff works for me and works good! So, I’m not going to stop dishing out my hard earned cash any time soon. Like maybe never. Besides her treatments, there is another reason I love Lory. She has integrity. She will tell me flat out whether she can or cant treat a certain condition. Just a few sessions ago, she told me she had nothing for my lower back condition, and to go see a chiropractor. she could have easily clipped me for another session, or even several, and I believe many practitioners would have, business being what it is. Lory is a masterful and innately talented practitioner. Her character structure is impeccable. If she says she can help, she really can. If she says she can’t, she can’t. Nothing is more important that the ability to trust the person who works on your body. Dig it! I have been going to Lory Lee for 2+ years. I have sciatic nerve issues. When I first met Lory I could hardly walk, Lory took me on as an emergency. I had seriously injured my back doing Spring Cleaning. It took 4 visits to get me pain free without the drugs that tore up my stomach. Also note that I am a big baby when it comes to needles. Lory made my fear of needles a non-issue, she is gentle and caring. This ancient way of healing is the very best way you can take care of yourself! Instead of taking prescription pain killers or prednisone I go once a month to get a tune up so I may exist pretty much pain free. I feel acupuncture is a way of putting my body in balance so every part of my body works properly. Another benefit of being balanced by acupuncture is that I have not been sick with colds or flus and I do not use flu vaccinations either. I am healthier due to my monthly acupuncture visits with Lory . You have everything to gain by trying the tried and tested practice of acupuncture. Simply put, hands down the best health care I have received in my life! I began my treatments with a list of symptoms that could only be classified as ‘conditions.’ I was at my limit of dealing with providers who half listened and prescribed pills that often made me feel worse, not better. Dr. Lee invested in my overall wellness, and went above and beyond the requirements of the job. It is hard to quantify everything Dr. Lee has done to help me but here are a few examples of her outstanding work: she did research on her own time, referred me to other great professionals, worked with me on insurance and navigating the health care system, and the treatments did wonders. When I go to Jade River Acupuncture, I know I am in good hands. I came upon Jade River Acupuncture by personal referral. I have been experiencing pain in my right sciatica for over 6 months. I tried stretching and chiropractic services and nothing seemed to help. Since seeing Dr. Lee now for over a month, I have few episodes with sciatica discomfort. I know I need to work on my posture as a dental hygienist but I feel I am making great progress with seeing Dr. Lee. Thank You Jade River Acupuncture. I have been dx with fibromyalgia, lupus, and arthritis. Needless to say I am in a considerable amount of pain. I wanted to find someone who could relieve my overall inflammation and joint pain. The treatments I receive are true life-savers! The amount of pain is diminished and my movement is better. I would eagerly (and have) recommend Jade [ River ] Acupuncture to family, friends, and total strangers. Lory has been taking care of my back and neck for long time now( Many years). She has the Magic Touch. When my pain fairs up she has me back and working without pain in a few visits. wonder full person. Compassion, knowledgeable, professional, and a great MOM. Give her a chance to work it out, it only takes a few visits and you will come out being amazed as to how good you feel the next day. Anybody who has never tried this form of treatment needs to open your mind and let her fix the problems. This REALLY WORKS. I went in to get Acupuncture for energy and feeling sluggish. I have been amazed at how much better I feel. I have renewed feeling of wellness! I have tons of energy now and I am no longer achey! The office is very warm and welcoming and the staff is very eager to help with insurance and scheduling. I was worried that it would hurt but I was surprised how relaxing it was. In my opinion Acupuncture is well worth the time and it works! Lori worked with me to relieve pain from a shoulder injury. I love the fact that her schedule is online for appointment bookings. After just a few sessions, my shoulder felt significant relief from the pain. As we continued, we discussed other health related issues that I was having, my goals for long-term fitness and general health. Lori gave me concepts and worked with me on all facets of my well being. Thanks Lori! I met Lori at the Federal Way farmer’s market. My first question was “do you take Group Health?” As soon as she said yes, I was all in. She took my information and called me a couple of days later and we set up an appointment. I’ve had back problems for years and was having a particularly rough bout. After one session, I felt instant relief. I went back for more sessions and my back has only gotten better. Lori has a gentle touch and the needles do not hurt at all. She is up front about needs and answered all my questions. Check her out for yourself. I first sought out acupuncture to help with a sensory integration issue I had struggled with since childhood. I contacted Lory because she accepted my insurance coverage. She was intrigued by my proposal and was willing to work with me despite not being within her general range of practice. It was surprisingly helpful and has made a dramatic difference in my daily life. I returned sometime later to deal with nerve damage resulting from an old injury. Again the positive impact from having made this decision has been remarkable. Lory is a skilled and compassionate practitioner that I highly recommend to friends and family. If they can’t for whatever reason are see her, I strongly encourage them to try acupuncture anyway. Before acupuncture I was always in severe pain in my knees. I have osteo arthritis. There were times I had to use a cane and was about to start using a wheelchair. I had been on medication and pain pills for quite awhile. I even went in and had the injections in my knees. There was no change, the pain was still there. The pain pills just were not working anymore so I started to take them more often. I knew I had to get off those pills. So the doctor recommended acupuncture, though he wasn’t sure how and if it would help.Since acupuncture I am no longer in any pain.Acupuncture did for me what medicine could not do. It is like a new lease on life. I’m back to my daily walks and I can walk up and down stairs all with NO pain.Lory is helping me with another problem I have. Thirty some years ago, I lost my sense of taste and smell. After 3 maybe 4 treatments, my taste and sense of smell are coming back. After 30 some years of no taste and smell, it’s like an explosion to my senses. It’s just unbelievable. Lory Lee has been a wonderful acupuncturist for my husband and I. Her skills as an acupuncturist are excellent, but her attributes extend far beyond that of an acupuncturist. She has a wonderful bedside manner. She listens, she truly cares about our overall health, and she is very knowledgeable in all sorts of supplements and other means by which to achieve better health and physical comfort. We would highly recommend her. What was the reason you sought Acupuncture treatment?I have bad disk in three sections of my neck, with disc disease, and pinched nerves. In addition arthritis throughout my neck and back. Had the steroid shots but they are just a Band-Aid and don’t last very long, with this treatment I can avoid surgery. How has Acupuncture treatment helped you with your condition?Very much, it took around 5 to 6 treatments before I felt the change in pain levels, now the pain is almost gone after 11 treatments. I will continue to go for more treatments as this really is the real deal and it works. Lory is a true professional and knows her business very well. I have reduced the pain pills to almost nothing now. What would you say to a friend or family member who was curious about Acupuncture? Don’t even think about any other form of treatment, this works, you just have to be patient, the pain will go away, let Lory do what she is best at. Read a book on Acupuncture to get to understand why and how it works, makes sense to me. It’s not a quick fix, it take several treatments, than all of a sudden you will feel the difference. What has pleased you most in your course of treatment? The pain levels keep getting lower and lower, your knowledge of where to place the needles is amazing and it really does not hurt at all. It’s very relaxing and peaceful. You told me from the very first day what you needed to do for me to be pain free and you have done exactly that. I will continue each month for a adjustment for the disc ,so they don’t get out of whack again. Additional notes/comments: My wife is getting treated by Lory Lee as well for nerve damage to her feet and Lory has replaced the quality of life to her with very limited pain left. She is at least 90 % better than just 3 months ago. She is able to walk some distances now without the pain. I trust that you will be just as amazed as we have been once you get a few treatments under your belt. What was the reason you sought Acupuncture treatment? Neck and back pain. How has Acupuncture treatment helped you with your condition? I found that it helped considerably with pain and range of motion. What would you say to a friend or family member who was curious about Acupuncture? It is virtually painless, relaxing, and most importantly it works. I have tried chiropractic methods for back pain, and although it seems to work, it doesn’t work for me as long as acupuncture treatments. What has pleased you most in your course of treatment? I have seen multiple acupuncturists in the last several years. One acupuncturist used larger needles, and about 50-100 at a time. I literally felt like a human pin cushion. It was painful and awkward, as I was afraid even to breath for fear of inadvertently moving the position of the many needles. Another acupuncturist, although he used minimal needles, the placement of the needles was such that it aggravated other conditions. Lori’s treatments are painless, she uses minimal needling to result in maximum benefit. Lori is very professional, takes the time to listen to you and often has helpful suggestions for treatment other than, or to compliment acupuncture, such as diet, exercise, herbal or natural remedies. Additional notes/comments: Lori may be able to treat other conditions besides pain. She has treated me for digestive issues. I thought for sure there was no way a few needles around my abdomen was going to help with my digestive symptoms, but to my complete surprise and amazement, her acupuncture treatment helped with that as well. Neck and Shoulder Pain, by: Allen Y. What was the reason you sought Acupuncture treatment? Pain in right arm and shoulder caused by broken neck in 1977. What would you say to a friend or family member who was curious about Acupuncture? Try it!!! What has pleased you most in your course of treatment? Real relief from pain. Additional notes/comments:I had had varying pain for over 30 years ranging from moderate to downright pass out pain. After several visits I had periods of no pain at all. At first this was unnerving because I had become so used to the pain it was as if something was missing when there was none. I am very glad to have those days with no pain at all and most days the pain is very moderate, certainly bearable, something I can work with. Chronic Headaches, by: Barbara W.
What was the reason you sought Acupuncture treatment? I turned to Acupuncture to help alleviate my headaches. I was on a daily regimen of Advil, with only minor relief. Then, after a yearly visit with my Doctor, and a blood work-up, she said my kidneys were at risk, due to all the Ibuprofen I was taking. Both she and my massage therapist recommended I try Acupuncture. How has Acupuncture treatment helped you with your condition? I am happy and relieved to say that it has decreased the frequency and the pain. What would you say to a friend or family member who was curious about Acupuncture? I am always referring my family and friends to try Acupuncture more specifically, to go to Lory, as I find her practice to be healing, while also relaxing. Tailbone Injury, by: Cathy G.
What was the reason you sought Acupuncture treatment? I had a tailbone injury that I had been fighting for almost 6 years. How has Acupuncture treatment helped you with your condition? I had tried every other type of treatment from cortisone shots to different medications and everything in between including internal massage and chiropractic. After only two treatments with Lory I was medication and pain free!! What would you say to a friend or family member who was curious about Acupuncture? DO IT!!! I have recommended acupuncture to everyone I know that struggles with some kind of pain or condition. What has pleased you most in your course of treatment? Being able to have my life back… not have it ruled by pain. Additional notes/comments: Lory is amazing – I am so grateful to have found her. She was recommended by several people and I know why! I will continue to go to her to maintain my pain free status.